The ADN Program prepares learners to become nurses who will improve individual, family, and community health and wellness by applying evidence-based skills and knowledge in their practice. Increased amounts of RNs will help meet the demand for professional nurses across the nation. Complete all didactic coursework completely online. 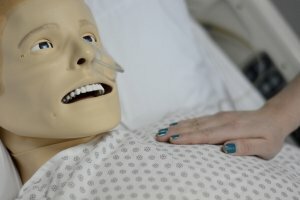 Learners prepare for patient care by engaging with high-fidelity mannequins during EL activities. EL activities will be completed locally at designated DDC partner facilities. The program is fully accredited by the Accreditation Commission for Education for Nursing (ACEN) and is built on the principles of Confidence, Competence, and Compassion. Our ADN program utilizes of a variety of innovative methods and learning modalities. These include online, blended, on-campus and distance learning, course structure, and high-fidelity mannequins in experiential learning sites. Questions about Admissions or Financial Aid? Speak directly with an advisor at (801) 689-2160. The ADN Program consists of 10 pre-licensure core nursing courses, delivered over 4 academic semesters, and 20 GE credits, delivered concurrently and in 1 additional academic semester. The total length of the Program for learners electing to complete all GE requirements at the College is 68 semester credits, or 5 academic semesters. The program also grants advanced placement to LPNs. The retail cost for the Program is $825 per semester credit. Nightingale College does accept a variety of financial aid options. Click here to view our financial aid page, which has a variety of scholarships and helpful links. Learners enroll in the blended-distance ADN Program and are classified as Hybrid-virtual. Learners engage in online didactic and on-ground experiential learning within a partner facility.